A flying boat is a fixed-winged seaplane with a hull, allowing it to land on water, that usually has no type of landing gear to allow operation on land. It differs from a floatplane as it uses a purpose-designed fuselage which can float, granting the aircraft buoyancy. Flying boats may be stabilized by under-wing floats or by wing-like projections (called sponsons) from the fuselage. Flying boats were some of the largest aircraft of the first half of the 20th century, exceeded in size only by bombers developed during World War II. Their advantage lay in using water instead of expensive land-based runways, making them the basis for international airlines in the interwar period. They were also commonly used for maritime patrol and air-sea rescue. Their use gradually trailed off after World War II, partially because of the investments in airports during the war. In the 21st century, flying boats maintain a few niche uses, such as dropping water on forest fires, air transport around archipelagos, and access to undeveloped areas. Many modern seaplane variants, whether float or flying boat types, are convertible amphibious aircraft where either landing gear or flotation modes may be used to land and take off. Gabriel Voisin, air pioneer, who made one of the earliest flights in a seaplane, with Henry Farman (left), in 1908. The Frenchman Alphonse Pénaud filed the first patent for a flying machine with a boat hull and retractable landing gear in 1876, but Austrian Wilhelm Kress is credited with building the first seaplane Drachenflieger in 1898, although its two 30 hp Daimler engines were inadequate for take-off and it later sank when one of its two floats collapsed. On 6 June 1905 Gabriel Voisin took off and landed on the River Seine with a towed kite glider on floats. The first of his unpowered flights was 150 yards. He later built a powered floatplane in partnership with Louis Blériot, but the machine was unsuccessful. Other pioneers also attempted to attach floats to aircraft in Britain, Australia, France and the USA. On 28 March 1910 Frenchman Henri Fabre successfully flew the first successful powered seaplane, the Gnome Omega-powered hydravion, a trimaran floatplane. Fabre's first successful take off and landing by a powered seaplane inspired other aviators and he designed floats for several other flyers. The first hydro-aeroplane competition was held in Monaco in March 1912, featuring aircraft using floats from Fabre, Curtiss, Tellier and Farman. This led to the first scheduled seaplane passenger services at Aix-les-Bains, using a five-seat Sanchez-Besa from 1 August 1912. The French Navy ordered its first floatplane in 1912. In 1911–12 François Denhaut constructed the first seaplane with a fuselage forming a hull, using various designs to give hydrodynamic lift at take-off. Its first successful flight was on 13 April 1912. Throughout 1910 and 1911 American pioneering aviator Glenn Curtiss developed his floatplane into the successful Curtiss Model D land-plane, which used a larger central float and sponsons. Combining floats with wheels, he made the first amphibian flights in February 1911 and was awarded the first Collier Trophy for US flight achievement. From 1912 his experiments with a hulled seaplane resulted in the 1913 Model E and Model F, which he called "flying-boats". In February 1911 the United States Navy took delivery of the Curtiss Model E, and soon tested landings on and take-offs from ships using the Curtiss Model D.
In Britain, Captain Edward Wakefield and Oscar Gnosspelius began to explore the feasibility of flight from water in 1908. They decided to make use of Windermere in the Lake District, England’s largest lake. The latter's first attempts to fly attracted large crowds, though the aircraft failed to take off and required a re-design of the floats incorporating features of Borwick’s successful speed-boat hulls. Meanwhile, Wakefield ordered a floatplane similar to the design of the 1910 Fabre Hydravion. By November 1911, both Gnosspelius and Wakefield had aircraft capable of flight from water and awaited suitable weather conditions. Gnosspelius's flight was short-lived as the aircraft crashed into the lake. Wakefield’s pilot however, taking advantage of a light northerly wind, successfully took off and flew at a height of 50 feet to Ferry Nab, where he made a wide turn and returned for a perfect landing on the lake’s surface. In Switzerland, Emile Taddéoli equipped the Dufaux 4 biplane with swimmers and successfully took off in 1912. A seaplane was used during the Balkan Wars in 1913, when a Greek "Astra Hydravion" did a reconnaissance of the Turkish fleet and dropped 4 bombs. In 1913, the Daily Mail newspaper put up a £10,000 prize for the first non-stop aerial crossing of the Atlantic which was soon "enhanced by a further sum" from the Women's Aerial League of Great Britain. American businessman Rodman Wanamaker became determined that the prize should go to an American aircraft and commissioned the Curtiss Aeroplane and Motor Company to design and build an aircraft capable of making the flight. Curtiss' development of the Flying Fish flying boat in 1913 brought him into contact with John Cyril Porte, a retired Royal Navy Lieutenant, aircraft designer and test pilot who was to become an influential British aviation pioneer. Recognising that many of the early accidents were attributable to a poor understanding of handling while in contact with the water, the pair's efforts went into developing practical hull designs to make the transatlantic crossing possible. At the same time the British boat building firm J. Samuel White of Cowes on the Isle of Wight set up a new aircraft division and produced a flying boat in the United Kingdom. This was displayed at the London Air Show at Olympia in 1913. In that same year, a collaboration between the S. E. Saunders boatyard of East Cowes and the Sopwith Aviation Company produced the "Bat Boat", an aircraft with a consuta laminated hull that could operate from land or on water, which today we call an amphibious aircraft. The "Bat Boat" completed several landings on sea and on land and was duly awarded the Mortimer Singer Prize. It was the first all-British aeroplane capable of making six return flights over five miles within five hours. 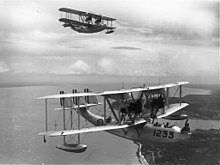 In the U.S. Wanamaker's commission built on Glen Curtiss' previous development and experience with the Model F for the U.S. Navy which rapidly resulted in the America, designed under Porte's supervision following his study and rearrangement of the flight plan; the aircraft was a conventional biplane design with two-bay, unstaggered wings of unequal span with two pusher inline engines mounted side-by-side above the fuselage in the interplane gap. Wingtip pontoons were attached directly below the lower wings near their tips. The design (later developed into the Model H), resembled Curtiss' earlier flying boats, but was built considerably larger so it could carry enough fuel to cover 1,100 mi (1,800 km). The three crew members were accommodated in a fully enclosed cabin. Trials of the America began 23 June 1914 with Porte also as Chief Test Pilot; testing soon revealed serious shortcomings in the design; it was under-powered, so the engines were replaced with more powerful engines mounted in a tractor configuration. There was also a tendency for the nose of the aircraft to try to submerge as engine power increased while taxiing on water. This phenomenon had not been encountered before, since Curtiss' earlier designs had not used such powerful engines nor large fuel/cargo loads and so were relatively more buoyant. In order to counteract this effect, Curtiss fitted fins to the sides of the bow to add hydrodynamic lift, but soon replaced these with sponsons, a type of underwater pontoon mounted in pairs on either side of a hull. These sponsons (or their engineering equivalents) and the flared, notched hull would remain a prominent feature of flying boat hull design in the decades to follow. With the problem resolved, preparations for the crossing resumed. While the craft was found to handle "heavily" on takeoff, and required rather longer take-off distances than expected, the full moon on 5 August 1914 was selected for the trans-Atlantic flight; Porte was to pilot the America with George Hallett as co-pilot and mechanic. Curtiss and Porte's plans were interrupted by the outbreak of World War I. Porte sailed for England on 4 August 1914 and rejoined the Navy, as a member of the Royal Naval Air Service. Appointed Squadron Commander of Royal Navy Air Station Hendon, he soon convinced the Admiralty of the potential of flying boats and was put in charge of the naval air station at Felixstowe in 1915. Porte persuaded the Admiralty to commandeer (and later, purchase) the America and a sister craft from Curtiss. This was followed by an order for 12 more similar aircraft, one Model H-2 and the remaining as Model H-4's. Four examples of the latter were assembled in the UK by Saunders. All of these were similar to the design of the America and, indeed, were all referred to as Americas in Royal Navy service. The engines, however, were changed from the under-powered 160 hp Curtiss engines to 250 hp Rolls-Royce Falcon engines. The initial batch was followed by an order for 50 more (totalling 64 Americas overall during the war). Porte also acquired permission to modify and experiment with the Curtiss aircraft. The Curtiss H-4s were soon found to have a number of problems; they were underpowered, their hulls were too weak for sustained operations and they had poor handling characteristics when afloat or taking off. One flying boat pilot, Major Theodore Douglas Hallam, wrote that they were "comic machines, weighing well under two tons; with two comic engines giving, when they functioned, 180 horsepower; and comic control, being nose heavy with engines on and tail heavy in a glide." The Felixstowe F.2A, the first production seaplane, and the basis for future development. At Felixstowe, Porte made advances in flying boat design and developed a practical hull design with the distinctive "Felixstowe notch". Porte's first design to be implemented in Felixstowe was the Felixstowe Porte Baby, a large, three-engined biplane flying-boat, powered by one central pusher and two outboard tractor Rolls-Royce Eagle engines. Porte modified an H-4 with a new hull whose improved hydrodynamic qualities made taxiing, take-off and landing much more practical, and called it the Felixstowe F.1. Porte's innovation of the "Felixstowe notch" enabled the craft to overcome suction from the water more quickly and break free for flight much more easily. This made operating the craft far safer and more reliable. The "notch" breakthrough would soon after evolve into a "step", with the rear section of the lower hull sharply recessed above the forward lower hull section, and that characteristic became a feature of both flying boat hulls and seaplane floats. The resulting aircraft would be large enough to carry sufficient fuel to fly long distances and could berth alongside ships to take on more fuel. Porte then designed a similar hull for the larger Curtiss H-12 flying boat which, while larger and more capable than the H-4s, shared failings of a weak hull and poor water handling. The combination of the new Porte-designed hull, this time fitted with two steps, with the wings of the H-12 and a new tail, and powered by two Rolls-Royce Eagle engines, was named the Felixstowe F.2 and first flew in July 1916, proving greatly superior to the Curtiss on which it was based. It was used as the basis for all future designs. It entered production as the Felixstowe F.2A, being used as a patrol aircraft, with about 100 being completed by the end of World War I. Another seventy were built, and these were followed by two F.2c, which were built at Felixstowe. In February 1917, the first prototype of the Felixstowe F.3 was flown. It was larger and heavier than the F.2, giving it greater range and heavier bomb load, but poorer agility. Approximately 100 Felixstowe F.3s were produced before the end of the war. The Felixstowe F.5 was intended to combine the good qualities of the F.2 and F.3, with the prototype first flying in May 1918. The prototype showed superior qualities to its predecessors but, to ease production, the production version was modified to make extensive use of components from the F.3, which resulted in lower performance than the F.2A or F.3. 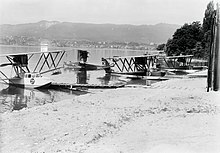 Porte's final design at the Seaplane Experimental Station was the 123 ft-span five-engined Felixstowe Fury triplane (also known as the "Porte Super-Baby" or "PSB"). F.2, F.3, and F.5 flying boats were extensively employed by the Royal Navy for coastal patrols, and to search for German U-boats. 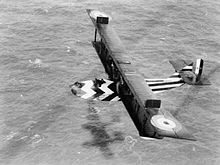 In 1918 they were towed on lighters towards the northern German ports to extend their range; on 4 June 1918 this resulted in three F.2As engaging in a dogfight with ten German seaplanes, shooting down two confirmed and four probables at no loss. As a result of this action, British flying boats were dazzle-painted to aid identification in combat. Felixstowe F5L under construction at the Naval Aircraft Factory, Philadelphia, circa 1920. The Curtiss Aeroplane and Motor Company independently developed its designs into the small Model "F", the larger Model "K" (several of which were sold to the Russian Naval Air Service), and the Model "C" for the U.S. Navy. Curtiss among others also built the Felixstowe F.5 as the Curtiss F5L, based on the final Porte hull designs and powered by American Liberty engines. Meanwhile, the pioneering flying boat designs of François Denhaut had been steadily developed by the Franco-British Aviation Company into a range of practical craft. Smaller than the Felixstowes, several thousand FBAs served with almost all of the Allied forces as reconnaissance craft, patrolling the North Sea, Atlantic and Mediterranean oceans. The Aeromarine Plane and Motor Company built some of the biggest sea planes of the time in Keyport, New Jersey. Mr.Uppercu built the factory on a 66-acre site in 1917 and Built the Aeromarine 75 and Aeromarine AMC flying Boats which with Aeromarine West Indies Airways flew Air Mail to Florida, Bahamas, and Cuba along with being passenger carriers. The German aircraft manufacturing company Hansa-Brandenburg built flying boats starting with the model Hansa-Brandenburg GW in 1916. The Austro-Hungarian firm, Lohner-Werke began building flying boats, starting with the Lohner E in 1914 and the later (1915) influential Lohner L version. In September 1919 British company Supermarine started operating the first flying boat service in the world, from Woolston to Le Havre in France, but it was short-lived. A Curtiss NC-4 became the first aircraft to fly across the Atlantic Ocean in 1919, crossing via the Azores. Of the four that made the attempt, only one completed the flight. Before the development of highly reliable aircraft, the ability to land on water was a desirable safety feature for transoceanic travel. In 1923, the first successful commercial flying boat service was introduced with flights to and from the Channel Islands. The British aviation industry was experiencing rapid growth. The Government decided that nationalization was necessary and ordered five aviation companies to merge to form the state-owned Imperial Airways of London (IAL). 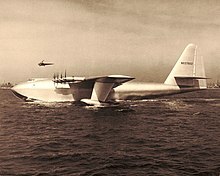 IAL became the international flag-carrying British airline, providing flying boat passenger and mail transport links between Britain and South Africa using aircraft such as the Short S.8 Calcutta. In 1928, four Supermarine Southampton flying boats of the RAF Far East flight arrived in Melbourne, Australia. The flight was considered proof that flying boats had evolved to become reliable means of long distance transport. In the 1930s, flying boats made it possible to have regular air transport between the U.S. and Europe, opening up new air travel routes to South America, Africa, and Asia. Foynes, Ireland and Botwood, Newfoundland and Labrador were the termini for many early transatlantic flights. In areas where there were no airfields for land-based aircraft, flying boats could stop at small island, river, lake or coastal stations to refuel and resupply. The Pan Am Boeing 314 "Clipper" planes brought exotic destinations like the Far East within reach of air travelers and came to represent the romance of flight. By 1931, mail from Australia was reaching Britain in just 16 days – less than half the time taken by sea. In that year, government tenders on both sides of the world invited applications to run new passenger and mail services between the ends of the British Empire, and Qantas and IAL were successful with a joint bid. A company under combined ownership was then formed, Qantas Empire Airways. The new ten-day service between Rose Bay, New South Wales (near Sydney) and Southampton was such a success with letter-writers that before long the volume of mail was exceeding aircraft storage space. A solution to the problem was found by the British government, who in 1933 had requested aviation manufacturer Short Brothers to design a big new long-range monoplane for use by IAL. Partner Qantas agreed to the initiative and undertook to purchase six of the new Short S23 "C" class or "Empire" flying boats. Delivering the mail as quickly as possible generated a lot of competition and some innovative designs. One variant of the Short Empire flying boats was the strange-looking "Maia and Mercury". It was a four-engined floatplane "Mercury" (the winged messenger) fixed on top of "Maia", a heavily modified Short Empire flying boat. The larger Maia took off, carrying the smaller Mercury loaded to a weight greater than it could take off with. This allowed the Mercury to carry sufficient fuel for a direct trans-Atlantic flight with the mail. Unfortunately this was of limited usefulness, and the Mercury had to be returned from America by ship. The Mercury did set a number of distance records before in-flight refuelling was adopted. Sir Alan Cobham devised a method of in-flight refuelling in the 1930s. In the air, the Short Empire could be loaded with more fuel than it could take off with. Short Empire flying boats serving the trans-Atlantic crossing were refueled over Foynes; with the extra fuel load, they could make a direct trans-Atlantic flight. A Handley Page H.P.54 Harrow was used as the fuel tanker. The German Dornier Do X flying boat was noticeably different from its UK and U.S.-built counterparts. It had wing-like protrusions from the fuselage, called sponsons, to stabilize it on the water without the need for wing-mounted outboard floats. This feature was pioneered by Claudius Dornier during World War I on his Dornier Rs. I giant flying boat, and perfected on the Dornier Wal in 1924. The enormous Do X was powered by 12 engines and once carried 170 persons as a publicity stunt. It flew to America in 1930–31, crossing the Atlantic via an indirect route over 9 months. It was the largest flying boat of its time, but was severely underpowered and was limited by a very low operational ceiling. Only three were built, with a variety of different engines installed, in an attempt to overcome the lack of power. Two of these were sold to Italy. The Dornier Wal was "easily the greatest commercial success in the history of marine aviation". Over 250 were built in Italy, Spain, Japan, The Netherlands and Germany. Numerous airlines operated the Dornier Wal on scheduled passenger and mail services. Wals were used by explorers, for a number of pioneering flights, and by the military in many countries. Though having first flown in 1922, from 1934 to 1938 Wals operated the over-water sectors of the Deutsche Luft Hansa South Atlantic Airmail service. The military value of flying boats was well-recognized, and every country bordering on water operated them in a military capacity at the outbreak of the war. They were utilized in various tasks from anti-submarine patrol to air-sea rescue and gunfire spotting for battleships. Aircraft such as the PBM Mariner patrol bomber, PBY Catalina, Short Sunderland, and Grumman Goose recovered downed airmen and operated as scout aircraft over the vast distances of the Pacific Theater and the Atlantic. They also sank numerous submarines and found enemy ships. In May 1941 the German battleship Bismarck was discovered by a PBY Catalina flying out of Castle Archdale Flying boat base, Lower Lough Erne, Northern Ireland. The largest flying boat of the war was the Blohm & Voss BV 238, which was also the heaviest plane to fly during World War II and the largest aircraft built and flown by any of the Axis Powers. In November 1939, IAL was restructured into three separate companies: British European Airways, British Overseas Airways Corporation (BOAC), and British South American Airways (which merged with BOAC in 1949), with the change being made official on 1 April 1940. BOAC continued to operate flying boat services from the (slightly) safer confines of Poole Harbour during wartime, returning to Southampton in 1947. When Italy entered the war in June 1940, the Mediterranean was closed to allied planes and BOAC and Qantas operated the Horseshoe Route between Durban and Sydney using Short Empire flying boats. The Martin Company produced the prototype XPB2M Mars based on their PBM Mariner patrol bomber, with flight tests between 1941 and 1943. The Mars was converted by the Navy into a transport aircraft designated the XPB2M-1R. Satisfied with the performance, 20 of the modified JRM-1 Mars were ordered. The first, named Hawaii Mars, was delivered in June 1945, but the Navy scaled back their order at the end of World War II, buying only the five aircraft which were then on the production line. The five Mars were completed, and the last delivered in 1947. After World War II the use of flying boats rapidly declined for several reasons. The ability to land on water became less of an advantage owing to the considerable increase in the number and length of land based runways during World War II. Further, as the reliability, speed, and range of land-based aircraft increased, the commercial competitiveness of flying boats diminished; their design compromised aerodynamic efficiency and speed to accomplish the feat of waterborne takeoff and landing. Competing with new civilian jet aircraft like the de Havilland Comet and Boeing 707 proved impossible. The Hughes H-4 Hercules, in development in the U.S. during the war, was even larger than the BV 238 but it did not fly until 1947. The Spruce Goose, as the 180-ton H-4 was nicknamed, was the largest flying boat ever to fly. Carried out during Senate hearings into Hughes use of government funds on its construction, the short hop of about a mile at 70 ft above the water by the "Flying Lumberyard" was claimed by Hughes as vindication of his efforts. Cutbacks in expenditure after the war and the disappearance of its intended mission as a transatlantic transport left it no purpose. In 1944, the Royal Air Force began development of a small jet-powered flying boat that it intended to use as an air defence aircraft optimised for the Pacific, where the relatively calm sea conditions made the use of seaplanes easier. By making the aircraft jet powered, it was possible to design it with a hull rather than making it a floatplane. The Saunders-Roe SR.A/1 prototype first flew in 1947 and was relatively successful in terms of its performance and handling. However, by the end of the war, carrier based aircraft were becoming more sophisticated, and the need for the SR.A/1 evaporated. During the Berlin Airlift (which lasted from June 1948 until August 1949) 10 Sunderlands and two Hythes were used to transport goods from Finkenwerder on the Elbe near Hamburg to isolated Berlin, landing on the Havelsee beside RAF Gatow until it iced over. The Sunderlands were particularly used for transporting salt, as their airframes were already protected against corrosion from seawater. Transporting salt in standard aircraft risked rapid and severe structural corrosion in the event of a spillage. In addition, three Aquila Airways flying boats were used during the airlift. This is the only known operational use of flying boats within central Europe. The U.S. Navy continued to operate flying boats (notably the Martin P5M Marlin) until the late 1960s. The Navy even attempted to build a jet-powered seaplane bomber, the Martin Seamaster. BOAC ceased flying boat services out of Southampton in November 1950. Bucking the trend, in 1948 Aquila Airways was founded to serve destinations that were still inaccessible to land-based aircraft. This company operated Short S.25 and Short S.45 flying boats out of Southampton on routes to Madeira, Las Palmas, Lisbon, Jersey, Majorca, Marseille, Capri, Genoa, Montreux and Santa Margherita. From 1950 to 1957, Aquila also operated a service from Southampton to Edinburgh and Glasgow. The flying boats of Aquila Airways were also chartered for one-off trips, usually to deploy troops where scheduled services did not exist or where there were political considerations. The longest charter, in 1952, was from Southampton to the Falkland Islands. In 1953 the flying boats were chartered for troop deployment trips to Freetown and Lagos and there was a special trip from Hull to Helsinki to relocate a ship's crew. The airline ceased operations on 30 September 1958. The technically advanced Saunders-Roe Princess first flew in 1952 and later received a certificate of airworthiness. Despite being the pinnacle of flying boat development none were sold, though Aquila Airways reportedly attempted to buy them. Of the three Princesses that were built, two never flew, and all were scrapped in 1967. Ansett Australia operated a flying boat service from Rose Bay to Lord Howe Island until 1974, using Short Sandringhams. The shape of the Short Empire, a British flying boat of the 1930s was a harbinger of the shape of 20th century aircraft yet to come. Today, however, true flying boats have largely been replaced by seaplanes with floats and amphibious aircraft with wheels. The Beriev Be-200 twin-jet amphibious aircraft has been one of the closest "living" descendants of the earlier flying boats, along with the larger amphibious planes used for fighting forest fires. There are also several experimental/kit amphibians such as the Volmer Sportsman, Quikkit Glass Goose, Airmax Sea Max, Aeroprakt A-24, and Seawind 300C. The ShinMaywa US-2 is a large STOL amphibious aircraft designed for air-sea rescue work. The US-2 is operated by the Japan Maritime Self Defense Force. The Canadair CL-215 and successor Bombardier 415 are examples of modern flying boats and are used for forest fire suppression. Dornier announced plans in May 2010 to build CD2 SeaStar composite flying boats in Quebec, Canada. The ICON A5 is an amphibious aircraft in the light-sport class. ^ a b c d e f g h i j k l m n o p q Hull, Norman. Flying Boats of the Solent: A Portrait of a Golden Age of Air Travel (Aviation Heritage). Great Addington, Kettering, Northants, UK: Silver Link Publishing, 2002. ISBN 1-85794-161-6. ^ Carpenter, Jr, G. J. (Jack) (2005). "Photographs 1914". GLENN H. CURTISS Founder of The American Aviation Industry. Internet Archive - Way Back Machine. Archived from the original on 20 October 2006. Retrieved 15 December 2015. ^ Bruce Flight 2 December 1955, p.844. ^ London 2003, pp. 16–17. ^ Hallam 1919, pp. 21–22. ^ "Felixstowe." Archived 1 September 2006 at the Wayback Machine NASM. Retrieved: 20 May 2012. ^ London 2003, pp. 24–25. ^ Bruce Flight 2 December 1955, p. 846. ^ "Felixstowe Flying-Boats." Will Higgs Co, United Kingdom. Retrieved: 24 December 2009. ^ "Engines of Our Ingenuity No. 1988: THE SARO PRINCESS". ^ "Flying-boats in Fermanagh". Inland Waterways News. Inland Waterways Association of Ireland. Spring 2002. Archived from the original on 20 July 2012. Retrieved 20 May 2012. ^ "Castle Archdale Country Park". Northern Ireland Environment Agency. Archived from the original on 1 May 2009. Retrieved 19 June 2009. ^ Goebel, Greg. "The Martin Mariner, Mars, & Marlin Flying Boats." Vectorsite. Retrieved: 20 May 2012. ^ Slepian, Katya. "Test pilot school a success for Martin Mars – Alberni Valley News". Alberni Valley News. Archived from the original on 4 March 2016. Retrieved 27 February 2016. Davies, R.E.G. Pan Am: An Airline and its Aircraft. New York: Orion Books, 1987. ISBN 0-517-56639-7. Wikimedia Commons has media related to Flying boats.